. . . there are still quite a few people around who say that Hammett did not write detective stories at all, merely hard-boiled chronicles of mean streets with a perfunctory mystery element dropped in like the olive in a martini. By the time Chandler wrote “I’ll Be Waiting” in 1939, however, he had pretty much dispensed with the olive. All the other ingredients of a great noir martini are there: the hotel detective, the deceptively vulnerable girl, shady underworld figures, menacing shadows, an ominous threat of violence. The only thing lacking is a murder mystery for the “paunchy” hero Tony Reseck to solve. 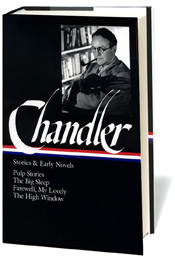 “I’ll Be Waiting” is the shortest of Chandler’s stories; it is also the first—and only—one published in a “slick” magazine. Nearly all his previous works of short fiction had been published in the pulps Black Mask and Dime Detective, but Chandler wrote one for the Saturday Evening Post at the behest of his agent and was motivated primarily by the money such magazines paid. I’m an improviser, and perhaps at times an innovator. Some slick writing is very good, on the surface, but it seems to lack something for me. . . . But perhaps I have a different idea about writing and shouldn’t be saying this. In their anthology of hardboiled fiction, editors Bill Pronzini and Jack Adrian regard the story as “a superbly atmospheric night-piece” and respond, “Chandler was a perceptive critic of others’ work, although less so of his own.” Indeed, still frequently included in anthologies, the story today is considered by many readers and critics as among his best and most polished (with a superb twist ending), and it has even been adapted for film twice, most recently in 1993 as an episode of Showtime’s Fallen Angels directed by Tom Hanks. Notes: On page 570, Goodman refers to musician Benny Goodman. One page 572, there are several contemporary cultural references: The Last Laugh is a 1924 movie starring Emil Jannings; “Spring, Beautiful Spring” (also known as “Chimes of Spring”) was a song written by Paul Lincke in 1903; The Blue Bird was Maurice Maeterlinck’s 1909 allegorical play, which became a movie in 1918. At one o’clock in the morning, Carl, the night porter, turned down the last of three table lamps in the main lobby of the Windermere Hotel. The blue carpet darkened a shade or two and the walls drew back into remoteness. . . . If you don't see the full story below, click here (PDF) or click here (Google Docs) to read it—free!